This is Yoshikazu Ono, world famous chef at the greatest sushi restaurant in the world. This bicycle is what he uses to pick up fish from the market. His other ride is a twin-turbo V10 Audi RS6. Yoshikazu Ono is a star of the recent documentary Jiro Dreams of Sushi, which briefly shows him standing beside his car and explaining his love of speed. It's a small moment in the film, which is understandable. The main focus is on this man, his father, and their 10-seat sushi restaurant Sukiyabashi Jiro located in a Tokyo subway station, of all places. It just happens to have three Michelin stars and takes months to get a reservation. His father, Jiro, is regarded by many as the greatest sushi chef in the world. Their sushi is seen by many as the best there is. 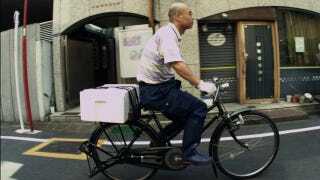 Given how packed it is at the Tsukiji fishmarket where he buys his fish, it's no surprise Ono stays on a narrow two-wheeler. It is no place for a two-ton, 580-horsepower superwagon. He certainly doesn't opt out of the Audi because he doesn't want to get fish smell in his car – high quality fresh fish is odorless.